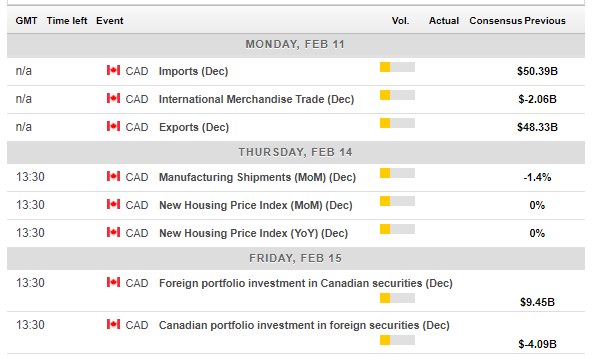 USD/CAD rose on the global mood but plunged on an excellent Canadian jobs report. A light calendar leaves sentiment and oil prices in the limelight. The technical picture is balanced for the pair and experts have mixed view as well. After a week that was dominated by the Fed's dovishness, the gloomy mood returned to markets. US President Donald Trump is not scheduled to meet Xi Jinping, his Chinese counterpart this month, as trade talks are still "miles apart." The European Commission and the Bank of England slashed growth forecasts, adding to the misery. The pressure in stock markets was mirrored in oil prices, which dropped from their highs. The stalemate in Venezuela does not seem to affect prices while lower growth prospects do take their toll. The news weighed on stocks and risk assets such as the Canadian dollar. However, Canada reported an impressive gain of 66.8K positions in January, much better than expected. The unemployment rate rose to 5.8%, but on top of an increase in the participation rate to 65.6%, an encouraging development. 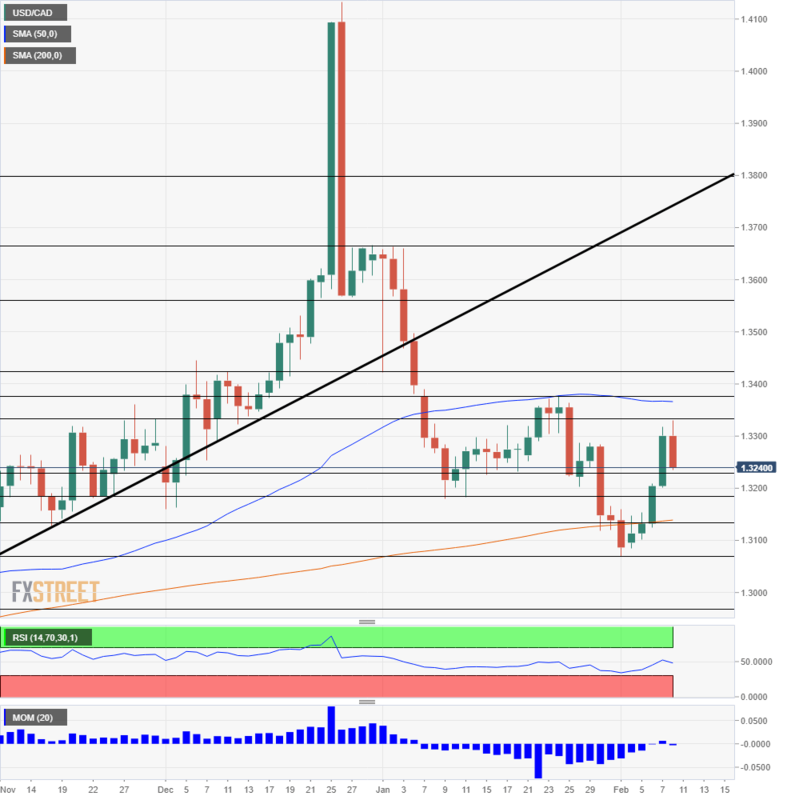 The news sent USD/CAD down from above 1.3300 to below 1.3250. Canadian data was mixed with an increase in building permits but a miss on the Ivey PMI. The US figures did not excel either, with a drop in the ISM Non-Manufacturing PMI and a second consecutive disappointment. However, the greenback remains "the cleanest shirt in the dirty pile. ", sought after in times of trouble. There are no top-tier indicators lined up in Canada. Nevertheless, the trade report on Monday will be of interest. Apart from the bottom line, the change in imports and exports will also matter. An increase in activity will help the loonie while a decrease may weigh. More importantly, fluctuations in oil prices could make a difference. The black gold is drifting lower once again, and it may continue falling. 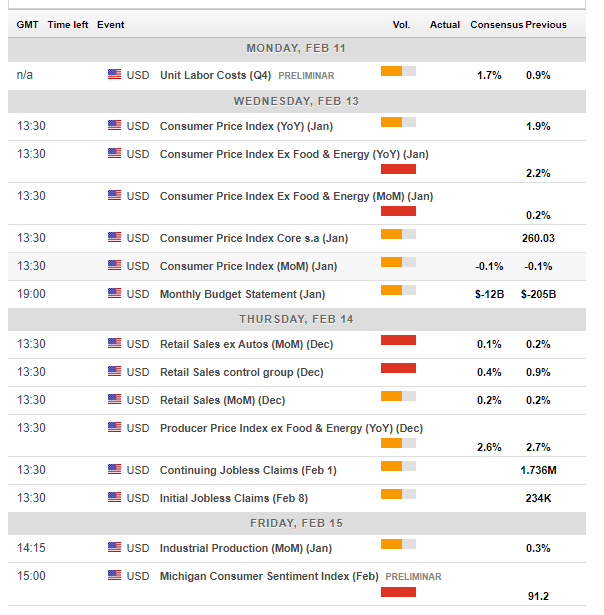 US inflation stands out in the middle of the week. Core CPI stabilized at 2.2%. The Fed is in no rush to raise interest rates as inflation is not going anywhere fast. An acceleration in underlying annual inflation could boost the greenback while a slide to 2% could send it lower. The second top-tier release comes on Thursday, with the retail sales report. Core sales are in the limelight, with the Control Group standing out after it leaped by 0.9% in December. A moderate advance is on the cards now. The last word of the week belongs to the University of Michigan's Consumer Sentiment gauge for February. It dropped considerably in January, probably due to the shutdown. Apart from the data, the impact of trade talks could continue growing as the March deadline approaches. An announcement about a summit between the Trump and XI or a delay of the deadline could help sentiment. Momentum on the daily USD/CAD chart has become balanced after long weeks of falls. The pair also recovered the 200-day Simple Moving Average while the Relative Strength Index stabilized around 50 after leaning lower beforehand. 1.3330 held Dollar/CAD down in February and even in early December. 1.3375 was a stubborn cap in mid-January. 1.3425 was a swing low at the wake of the new year and switches to resistance. 1.3570 provided support when the pair traded on higher ground in late December. 1.3670 was the peak around the same time. 1.3230 provided support in mid-January, and 1.3180 had the same role earlier in the month. 1.3140 worked as support in November. It is followed by the fresh February low of 1.3070. Below 1.3000, we find 1.2960, a line that dates back to the autumn of 2018. The mood is set to remain depressed, thus weighing on the loonie. Also, oil prices have not fallen that much, and there's a potential for more drops. All in all, USD/USD has room to rise. 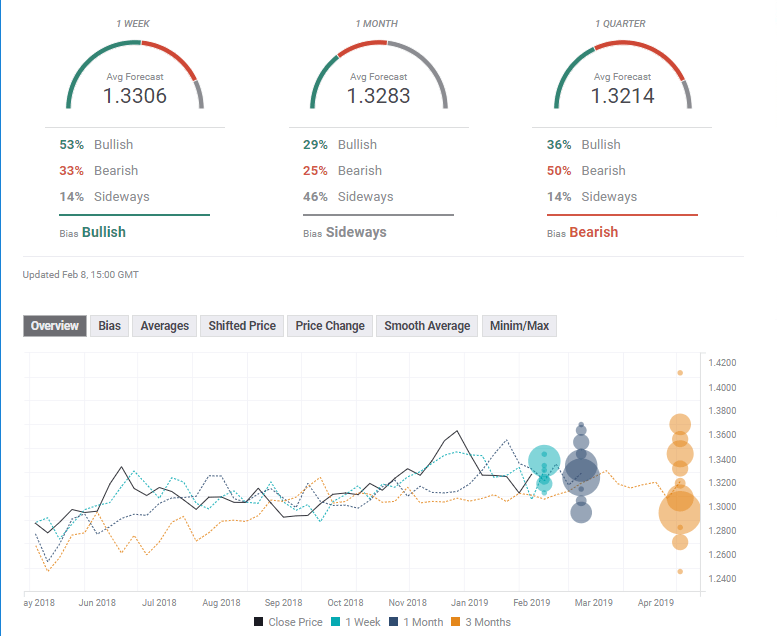 The FXStreet forex poll of experts shows a deteriorating picture for the pair: bullish in the short-term, sideways in the medium term and bearish in the long term. Forecasts for all timeframes have been upgraded in the past week.